Prior to the opening of the American Embassy in Jerusalem on 14 May 2018, the United States maintained its embassy in Tel Aviv, and a consulate general in Jerusalem as part of the "Consular Corps of the Corpus Separatum". [full citation needed] When Israel was founded, the position of the United States was that its recognition of Israel did not imply a particular view on the status of Jerusalem. The US voted for the UN Partition Plan in November 1947, which provided for the establishment of an international regime for the city, and Resolution 194 in 1948, following the 1948 Arab-Israeli War. 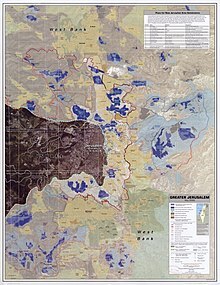 But the US voted against Resolution 303 in 1949 which reaffirmed that Jerusalem be established a corpus separatum under a special international regime to be administered by the UN, because the US regarded the plan as no longer feasible after both Israel and Jordan had established a political presence in the city. Since then the US position has been that final status of Jerusalem be resolved through negotiations, and it did not recognize Jerusalem as Israel's capital prior to President Donald Trump's announcement on 6 December 2017.